I did not decide on fabric placement. I simply opened the package and started with the first precut and stopped when I had the size quilt I wanted. The pillow matches the quilt and was stuffed with Silky Soft polyester fiber. 1. Assemble the quilt by columns first. 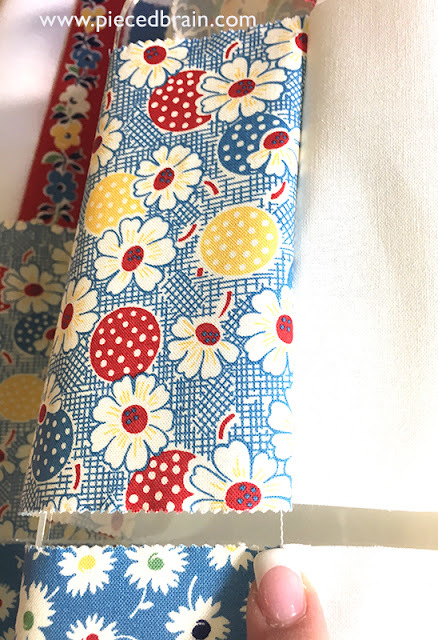 Sew a white 2 1/2" x 5" rectangle to the right edge of a Jolly Bar, repeat with another Jolly Bar and white rectangle without breaking the thread. Repeat with 4 more Jolly Bars and rectangles. Next you will begin the second column: sew a Jolly Bar to the first rectangle, and repeat till the end of the column. Repeat until you have a 'panel' of four sets of Jolly Bars as first photo above. 2. In order to keep the order of the Jolly Bars, clip the top row of Jolly Bars and press seams. Sew the 2 1/2" x WOF strips of white fabrics together end to end with diagonal seams. Press seams open. Stitch this white strip to the bottom of the top row you just pressed. Trim. Sew the 1 1/2" x WOF yellow strips together end to end with diagonal seams. Press seams open. Stitch this yellow strip to the white strip you just stitched. Trim. Stitch another strip of white onto the yellow strip. Trim and press seams. 3. Clip the second row of Jolly Bars and press seams. Repeat step 2 until you finish with a row of Jolly Bars at the bottom of quilt top. Make a quilt sandwich with backing, batting and quilt top and quilt as desired. Stitch binding strips together end to end with diagonal seams. Press seams open, press binding strip in half, and attach it to front of quilt. Flip it to back and hand stitch binding in place. 4. 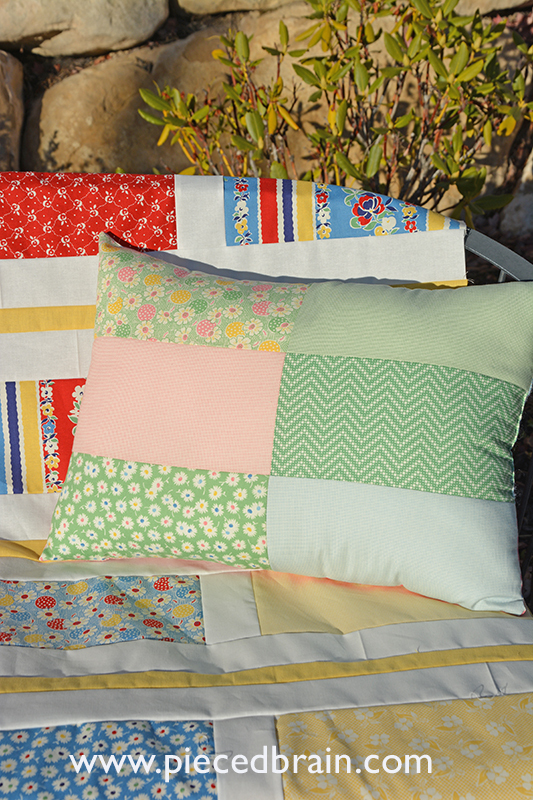 For pillow, sew together six Jolly Bars for the front and six for the back. Press seams. With RST, stitch all sides leaving an opening of 5". Press seams, flip pillow inside out, press seams again, fill it with polyester filling and hand stitch the opening to close it. Done!!! Cool huh? It worked for me as I made these two projects in less than 3 hours! I will quilt it with simple straight lines. 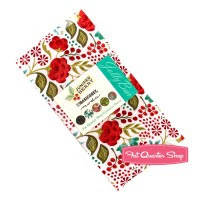 Here is the best part: Fat Quarter Shop is sponsoring this giveaway! - Leave me another comment if you would like, to tell me you follow this blog. Make sure I have a way to contact you (if you are a noreply blogger, give me your email as "soandsoatanynetdotcom so you don't get spammed [do not use the @ symbol and .com]). The winner will be announced here on Monday, November 21, in time for a Happy Thanksgiving. So, play along and have a fun day! I guess experience counts for a lot in quilting. It looks yummy and you didn't decide on placement beforehand. It would have taken me at least a day to decide on placement. You're amazing. My favorite "fast" quilt is a disappearing 9 patch. Fast in quotes because quilts take me a while! Fast? Rail Fence! This looks just as fast and wonderful fabrics! I like to do a triple rail as has so many options and is very fast. I follow you by email and am very glad that I do. Happy to follow you neat Blog by Blog lovin' ! I follow viz email. Thanks. For a really quick quilt I sash between 10" squares. Or I love the jelly roll dash. Thanks. My favorite fast quilt is Turning Twenty. I love your quilt and the fabrics! What a fun quilt. I would have been excited to share it too! My favorite quick quilt is the quick strippie from http://www.maryquilts.com/quick-strippie/. Thanks for sharing the giveaway! I follow via Instagram as ceciliaquilts and via bloglovin. Oh that looks great and fast is alwyas good with me,lol! I love the zig zag pattern with layer cakes cut into triangles! Thanks so much! I don't really have one favourite, but the Missouri star quilt company has lots of great quick quilt tutorials I plan to make. I don't really have a favorite go-to pattern for fast quilts because I'm not fast in making quilts. No matter what size or how simple, I'm very much a perfectionist. I love jelly roll tops. I'm confused by the write-up on the quilt. 1. You say that the quilt is put together in columns. It appears to be sewn together in rows to me. If the orientation of the quilt in the pictures were rotated so the yellow stripe is vertical instead of horizontal, I would agree. 2. I don't see that the pillow matches the blocks in the quilt. I would say the pillow coordinates with the quilt. The pillow appears to be made from the same line of fabric, not from the same fabrics to match. The jolly bars are stitched in columns as the photo shows. Then, the threads are snipped and each row is then the strips are stitched to the jolly bars. I love simple rail fence patterns that can be flexible so extra blocks can be used for a different look. I really haven't made any quick quilts. Seems like every pattern I pick is time consuming! Might be why I have so many ufos laying around! I follow you by email and bloglovin'! 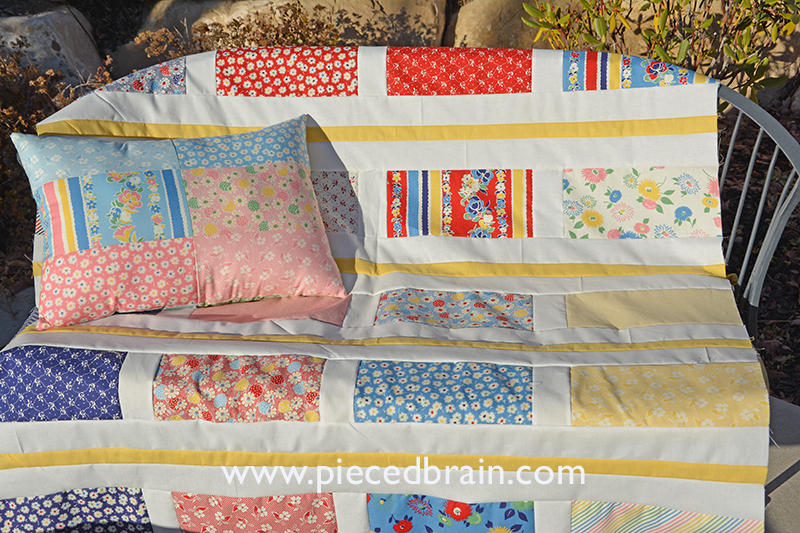 Easy patchwork.... love just doing simple squares together! For a fast quilt you can't beat squares! I love simple 10" squares pieced together. Hi. I follow you on email. My favorite "quick quilt" is taking 5"squares and sashing them with a neutral or even sometimes a WOW fabric. Thank you for sharing your great pattern and tutorial! Plus, providing the opportunity, along with the Fat Quarter Shop for sponsoring the give away! Have a fantastic creative day! I like Disappearing Nine Patch quilts for something quick. Very little matching, so they are fast. And if you make them from charm squares the cutting can be minimized. Or you could cut Jolly Bar pieces in half and use them. What a super cute pattern! I like that you kept the jolly bar pieces whole...that makes it sew up fast and focuses on the fabrics. 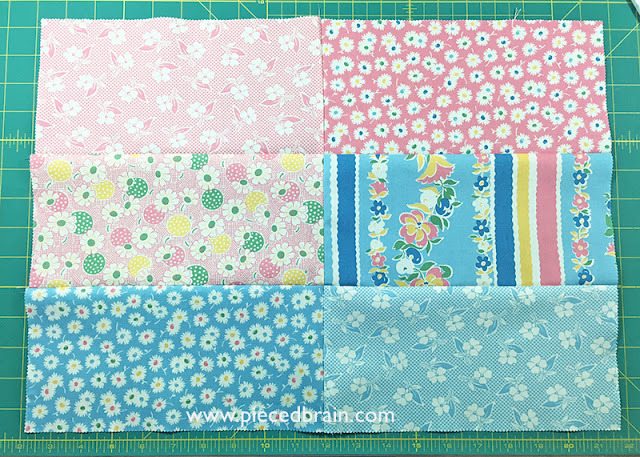 I think my favorite fast pattern is just simple patchwork: charm squares sewn together until the quilt is big enough. Talk about quick and easy! For a little more interest, I love 16 patches made from jelly rolls. I follow you via email. Thanks for writing up this fun pattern and hosting a giveaway! My favorite pattern is the Colorado block. A big reason is because I live in Colorado! I don't really do quilts, but I did an easy one, one time, and took large blocks with a fun center and then just surrounded the center block, 2 times with strips of fabric, came together pretty easy. Lovely quilt and pillow, Denise. I suppose the fastest quilt would be a one-patch which can be boring -- interesting if fabric and color placement are given attention. Thank you for the pattern. I follow your blog on feedly. I like to make the giant vintage star...fast and easy... especially for a baby quilt! I am an email and bloglovin follower! I follow you via email and on Instagram. P.S. 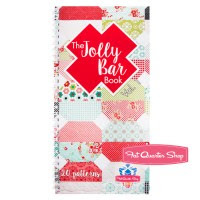 This is a cute quilt, looks like it would be fun to do for Christmas with that Jolly Bar! I've made a couple turning twenty quilts. I like how they make a bed-sized quilt and how I can use a fat quarter bundle to avoid the stress of fabric selection. So beautiful quilt.My favorite is nine patch block,quick and with fantastic setting! My favorite fast quilt is the disappearing nine patch. So many different ways to make it come out! I do follow your blog by email.Thanks. I like a nine patch for a fast quilt! thanks!! I follow your blog w/ bloglovn and by email! thank you again! I love making string blocks for a fast quilt. I don't have just 1 favorite pattern. Anything that uses pre-cuts my go-to pattern. Wesome to win!! Thanks so much for the chance!! I do follow you... via email, Bloglovin, and IG!! Thanks for another chance!! Ficou maravilhosa!!! !AMEI!Meu sonho é fazer uma com blocos guerra civil hehehehe será?!! !Mas não em costuras de máquina...no papel como os hexágonos....Faço colchas rápidas com nove pedaços e tiras nos encontros deles,mas não sei nome.rsrsrsrs.Estarei torcendo para eu ganhar faria para minha neta,tão delicado padrão. tiacarminhapezzuto@gmail.com Sigo por blogovim e Email.Bj Grannnde!!! I follow you via email. And I love your posts! A fast quilt pattern for me would be a disappearing 9 patch! That looks great. I like that strip of yellow in it. I haven't used the jolly bars precuts yet. I think my favorite fast quilt is a D4P or a D9P. They look so complicated. My favorite fast quilt pattern is the Nine Patch.Thank you for the giveaway. I think a log cabin is a fast quilt and so fun. Your quilt came out great. I would have to keep arranging and rearranging the pieces. I like the rail fence pattern for a quick quilt. Think my "fast to do" quilt is probably Pinwheels...tho have only made two! LOL Your Quilt & Pillow are cool! Easy & Quick & Awesome!! My fave fast pattern is a quick disappearing 9-patch table runner. not sure about a quilt pattern. 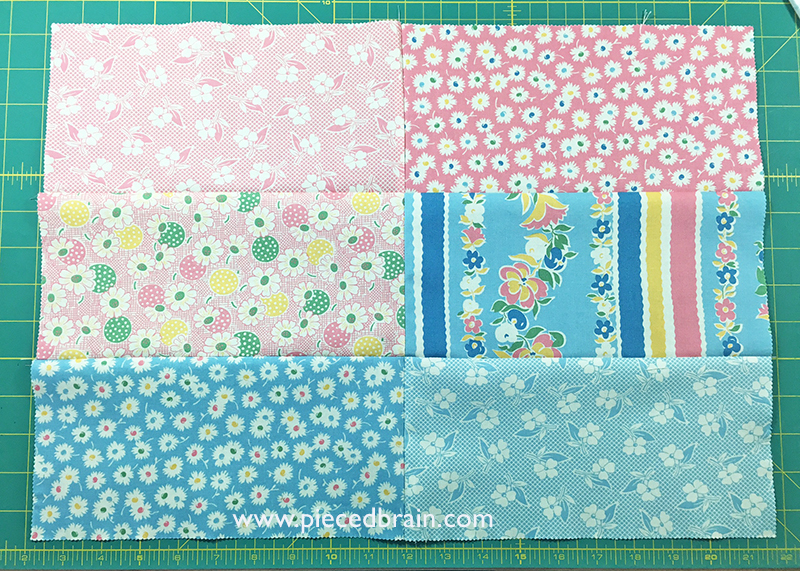 I like a simple nine patch or rail fence for a quick quilt. My favorite fast quilt design is a 9 patch using at least 6 inch blocks. It cuts up fast and sew together even faster! I don't seem to make any quilt fast. I love the disappearing 4-patch blocks. I have been sewing up several St. Louis 16 Patch quilts for holiday gifts with my short ends and scrap pieces. They are so fast and easy to make up. The blocks finish at 14" so 12 blocks (3x4) makes a great child quilt and 20 blocks (4x5) makes a nice sized lap quilt. See quick and easy. I follow your blog via Bloglovin and by email. The jolly bar is a convenient sized precut. I like your quilt and it is quick and easy. I do a baby quilt that is fast and easy. It is made with strips that are sewn together. They then are recut and moved so that the quilt is square and the fabric forms a diagonal design. It is much easier done than it is described. My favorite fast quilt pattern is flying geese. My favorite easy and fast block is the pinwheel block. I make charm (square) quilts if I'm in a hurry. 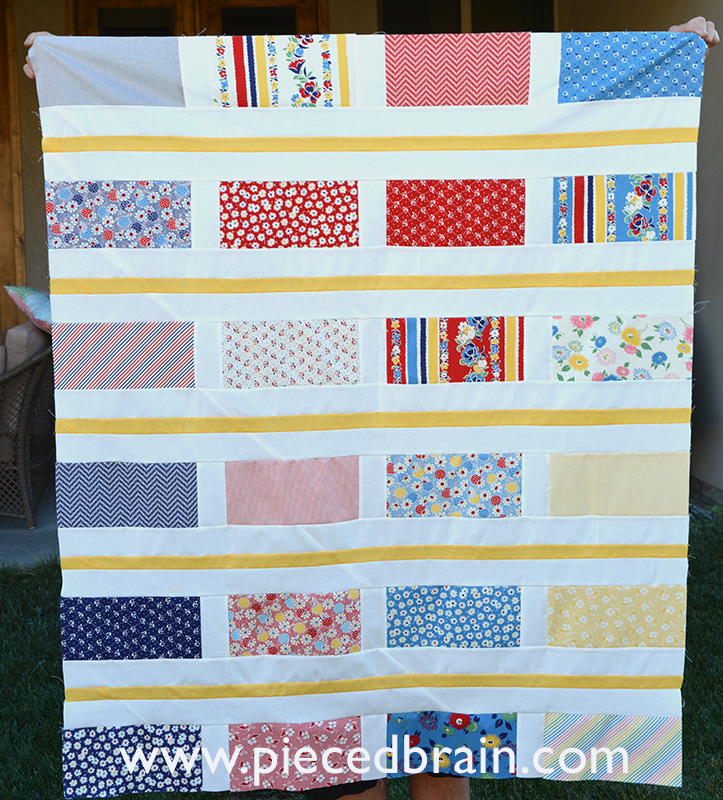 Rail Fence is my go to fast quilt. 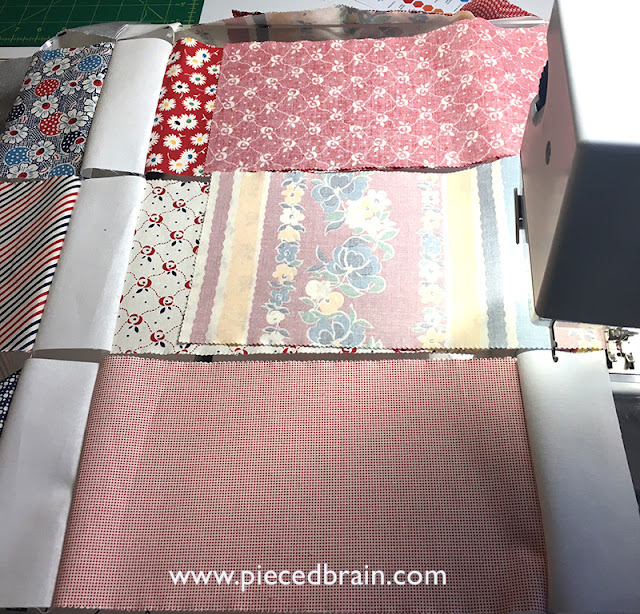 Looks good with any fabrics and is fast with strip piecing - faster yet if you cut wider strips. Cute quilt & love the pillow. Thanks for sharing. I have been your follower for a long time using Bloglovin. I guess a D9P is a favorite but I mix it up. I really like the 3 Dudes strip quilt pattern. I follow by E-mail and BL. I like log cabin quilt block. I follow you be email. My favorite fast quilt is a jelly roll race. I like this quilt and will definitely make one with this pattern. Thanks! One of my favorite quick patterns is called Sticks and Bricks and appeared in a Better Homes & Gardens quilting magazine several years ago. Your pattern will be perfect for the ladies in our quilting ministry, most of whom are new quilters. Thanks for sharing! I don't make fast quilts, so I don't have a favorite pattern, but the first quilt I ever made was the jelly roll race quilt. It wasn't fast for me then because I was a new quilter, but it would probably qualify as a fast quilt. I make quilts that catch my eye. I follow you via email. It's nice to sit down at my laptop with a cup of coffee every morning and read about what everyone in the quilty world is doing. I love this quilt! My favorite fast quilt pattern is to simply sew charms together until the top is the size I want to make. Thanks! My favorite fast quilt pattern is a disappearing ninepatch. Thanks for sharing your lovely quilt! I'm not sure if it is considered fast, but I like the Ohio Star blocks. I like the simplicity of a 9-patch! I will say Bricks and Stepping Stones by Bonnie Hunter. This was fairly quick and a fun pattern too. my first quilt was very simple, Color Block by Bijou Lovely Designs. Fast quilt: Jelly Roll Race or simple Rag Quilt. I follow you by getting emails from Bloglovin. I love anything fast. I've made some scrappy quilts just cutting different size strips. Those seem to work out well and easy to quilt. The quickest quilts for me are scrap quilts cuz anything goes. I also like to do a star or boat block and then surround them with 6" squares or whatever fits. It is a good way to use up scraps if they can be cut to 6.5 and a nice big 24" block in there adds interest. Giant Vintage Star is my quick go to quilt pattern. I am a follower of yours by email and bloglovin. I like to make Irish chains with Kelly rolls and cakes..
if I find I need a baby quilt right now. I use big squares and off set them. use cute fabrics and voila. I really like quilts pieced with simple squares. The quickest quilt pattern for me are Pinwheels and they are so sweet too!! I follow you via Bloglovin, email, and IG. Thanks!! 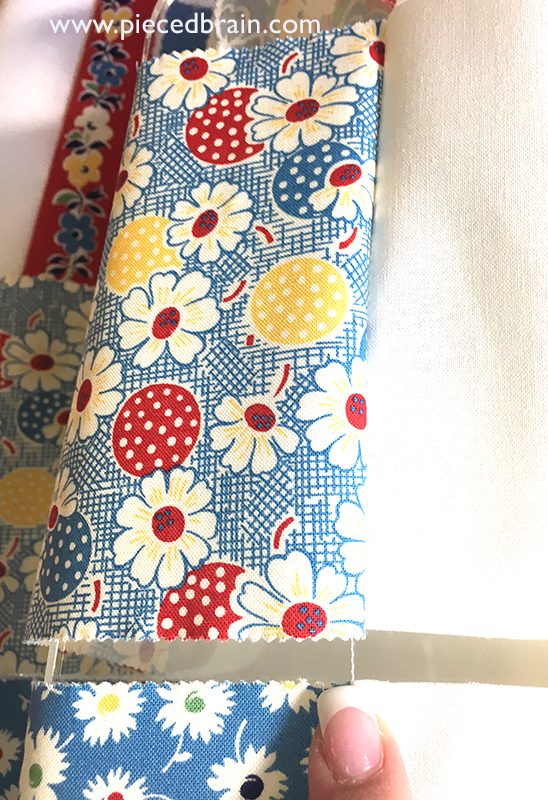 I love pinwheels but my favorite for baby quilts is made up of 4-1/2 inch squares of great I-spy fabrics with 1-1/2 inch sashings. Your jolly bar project is so sweet, I love the vintage appeal of those fabrics. Sometimes I like quilt tops that involve strips. It always seems to come together easily that way. I think 9-patches and one-patch quilts are pretty simple. Yours looks great! I follow your blog on Bloglovin'. Thanks for the great tutorial and giveaway. My favorite fast quilt is Turning Twenty. I follow your blog by.email. 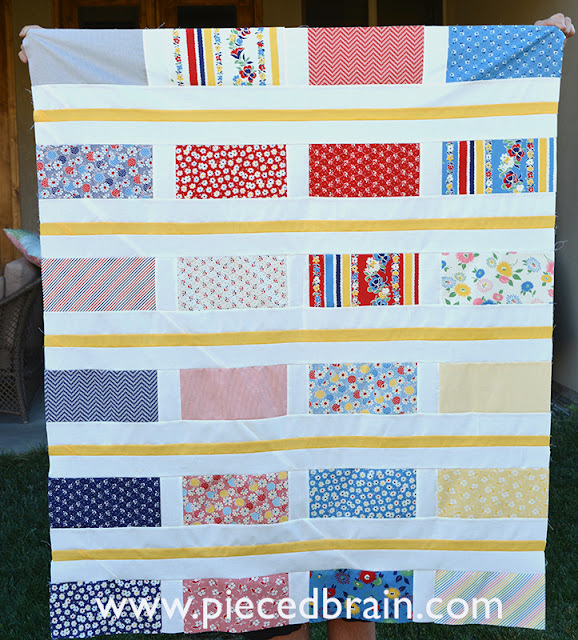 Rail Fence would be my favorite fast quilt! thank you!! I follow your blog w/ email! I love a simple postage stamp quilt. There is something so exciting about the different fabrics.